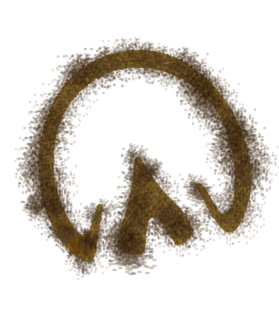 Boy, it sure has been hot and humid lately! This weather got me thinking that it would be a good time to remind everyone about a disease that can be a seasonal threat to horse health during hot summer months. Cases of Potomac Horse Fever can occur any time between late spring and early fall, but are more common as temperatures rise in July, August and September. Potomac Horse Fever is caused by the bacterium Neorickettsia risticii. Unlike other seasonal equine diseases such as Eastern Equine Encephalitis or West Nile Disease, horses do not contract Potomac Horse Fever through a bite from an infected fly or mosquito. In the case of Potomac Horse Fever, horses can be exposed by inadvertently ingesting snails or hatched aquatic insects that are carrying N. risticii. These insects and snails often are consumed with feed or water. While there is an obvious danger of exposure in wet, low-lying areas, it is important to remember that horses do not need to live next to a river, stream, or other body of water for them to be at risk of infection. One common recommendation for prevention of Potomac Horse Fever in stabled horses is to turn off barn lights at night. These lights tend to attract insects, which can fall into and contaminate feed and water when they die. One of the first recognizable symptoms of Potomac Horse Fever is a sudden-onset fever, so if your horse develops a fever very quickly, it is important to contact your veterinarian ASAP! Other symptoms include mild depression, decreased appetite, decreased or absent gut sounds and watery diarrhea. Infected horses can be successfully treated with antibiotics, usually intravenous oxytetracycline, in the early stages of the disease. The sooner the vet is able to treat your horse, the better the chance your horse will have of recovering! That is why it is important to always monitor your horses for any behavioral changes and take their temperature if you suspect they might be sick. For information on how to take your horse’s temperature and other vital signs such as respiration and heart rates, check out this Fact Sheet available on the Rutgers Equine Science Center website. 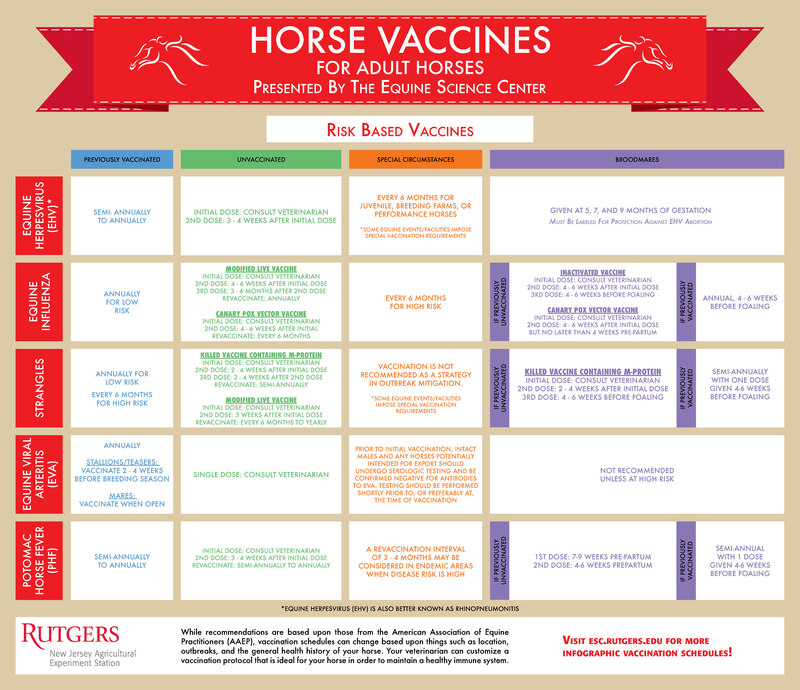 Check out the Rutgers Equine Science Center’s “Horse Vaccines for Adult Horses: Risk Based” pdf here. Horses typically recover quickly, responding to treatment within 12 hours. However, this condition is serious, especially if the early symptoms are not recognized, and the overall fatality rate is 5-30%. Horses with Potomac Horse Fever are notcontagious and therefore do not need to be isolated from other, healthy horses at your farm. A vaccine for Potomac Horse Fever is available from your veterinarian. Unfortunately, the vaccine only offers marginal protection. Vaccination is still recommended, however, as vaccinated horses will typically experience a milder form of the disease if infected. Protection following vaccination is short-lived (approximately 3-4 months). In certain areas where PHF is commonly found (endemic), your veterinarian may recommend administering the vaccine in the spring and again in the late summer to provide protection through early fall when risk of exposure may still be high. So, if your horse hasn’t gotten a booster for Potomac Horse Fever since spring, it would be a great time to chat with your veterinarian about vaccination protocols and the risk factors for your horse. In the meantime, if your horse is stalled at night, turn off the lights in the early evening to avoid attracting any potentially infected bugs. Finally, remember how important it is to periodically check your horse’s temperature and watch for any changes in behavior that might indicate that your four-legged friend is feeling under the weather. Let’s all help keep our horses healthy so they (and you!) can enjoy the rest of your summer!